Technology companies will allow sexual harassment claims to go to court. 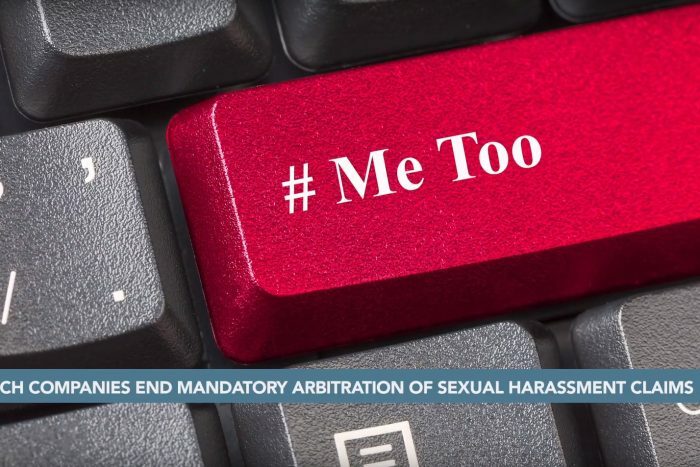 In November, several tech companies, including Airbnb, eBay, and Square, announced that they would make arbitration optional for individual sexual misconduct claims. Microsoft and Uber have also made similar changes in the past year. While the trend is most notable in the tech industry, there has been some movement in other sectors with competitive talent markets. But in light of the Supreme Court’s Epic Systems decision earlier this year, which allowed employers to require such claims to be arbitrated, it is unclear how widespread the shift will be. The National Labor Relations Board (“NLRB” or “Board”) moves forward with its new rule to redefine “joint employer” status. The extended comment period for the rule ends on December 13. Board Member William Emanuel has been cleared of any conflicts of interest for his role, so the rulemaking process should now continue on schedule. Not so fast with potential changes to the so-called “quickie election rule,” though. That Obama-era rule significantly shortened the average time between the filing of a petition and the date of votes on union representation. While many saw a 2017 Request for Comments on the rule as a sign that the Board might move forward with changes, the agency recently announced that reconsidering the election rule has been downgraded to a “long-term” action item. For further information, or to subscribe for updates, click here.